Mounting your TV above your fireplace is classic way to bring together two focal points in your room. It allows you to position your furniture to focus on one part of your room, rather than trying to balance between two important features. 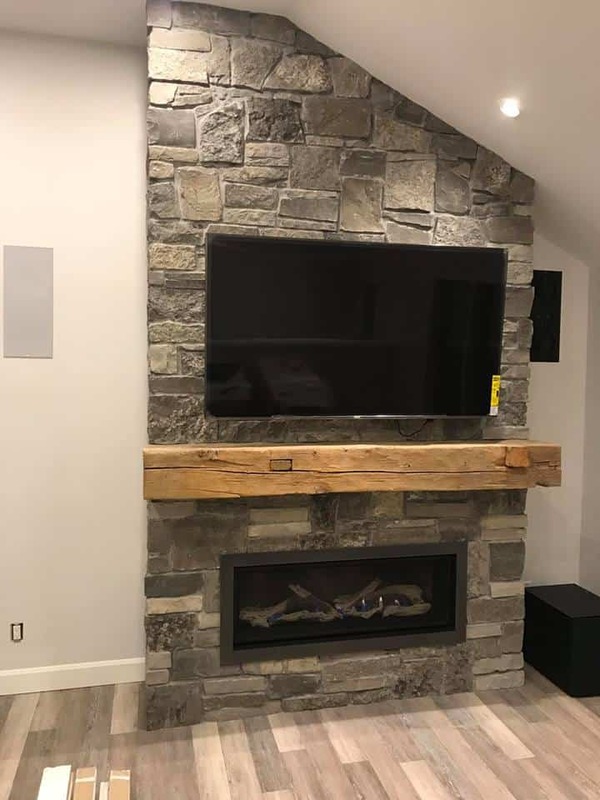 Mounting your TV above your fireplace isn’t as simple as just installing it though. Without some sort of barrier between the TV and high temperatures from the gas fireplace, your TV won’t stand a chance. The heat will ruin the electrical, and you’ll be stuck looking at a very expensive black box on your wall. There are a few ways you can avoid Cooked TV Syndrome, we’ll touch on most of them below. Just remember that each fireplace has its own specific clearances for mantels and other combustible materials. Always be sure to consult your manual before installing anything above your fireplace. Mantels are a classic, tried and true way to put a barrier between the heat from your appliance and your electronics. They’re available in a wide variety of materials, styles and finishes. Pick your material and size, then consult the table of mantel clearances in your manual to determine how high your mantel needs to be above your fireplace (this typically has a lot to do with how deep it is). Here at Safe Home Fireplace, we’re big fans of the classic rustic beam-style mantel. 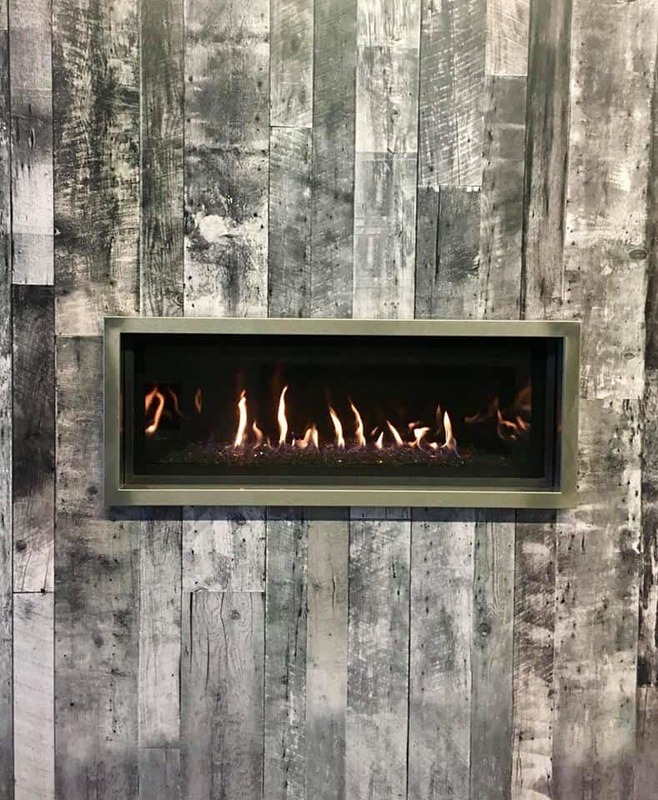 We have them custom made to whatever size and colour you want and can typically install it for you the same day we install your fireplace – depending on the finishing material going around the fireplace. Alongside the mantel, you can also recess your TV back a bit further than the front of the fireplace. This is most often done to create a shelf that you can set your TV and other electronics on without mounting them to the wall. This is typically done with a mantel to give you a more finished look. The difference is going to be the smaller amount of finishing material above the mantel so that there is room for the TV and other electronics. Some fireplaces will give you the option for a vented chase. This will allow you to mount your TV, or a piece of art, above the fireplace without requiring a mantel or any other barrier to break the heat. 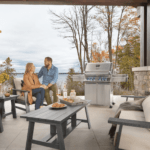 These systems take the heat coming from the fireplace and move it through either an open chase above the fireplace or small vents that are attached to the top of the fireplace. These systems reduce clearances and can sometimes allow you to move heat to other parts of the room. Always be sure to research the fireplace you are considering purchasing, as these options are not available with all models from all manufacturers. 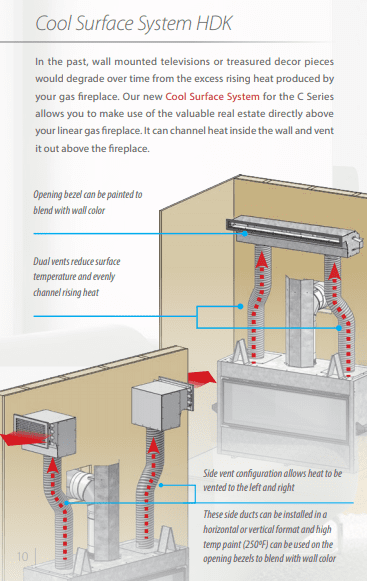 We feature two brands of fireplace that offer these types of systems. The Enclave from Marquis features a similar system, just with four flexible ducts instead of two. 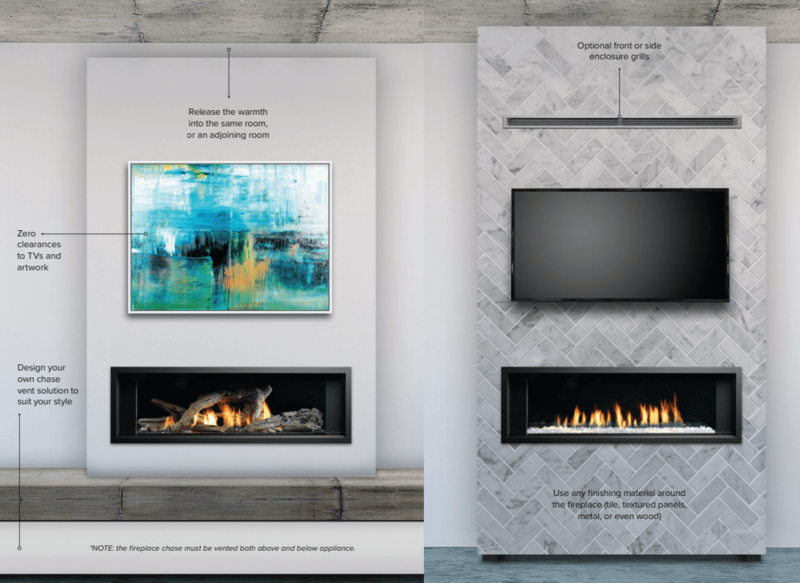 The Enclave also allows you to connect only two of the ducts and move the heat into a different room on the same level – giving you even more flexibility with your fireplace. The Skyline III from Marquis and the ZRB46 from Kingsman don’t feature a flexible duct system to cool the wall above them, instead making use of an open chase above the fireplace. This allows the heat, which will naturally rise, to be expelled from an opening close to the ceiling. This option allows you a lot of flexibility as you can create vents to allow the heat to be released, or you can simply just leave the top of the framing open to allow heat to flow freely. As mentioned above, these types of systems are available from many different fireplace manufacturers but often include just a few models. 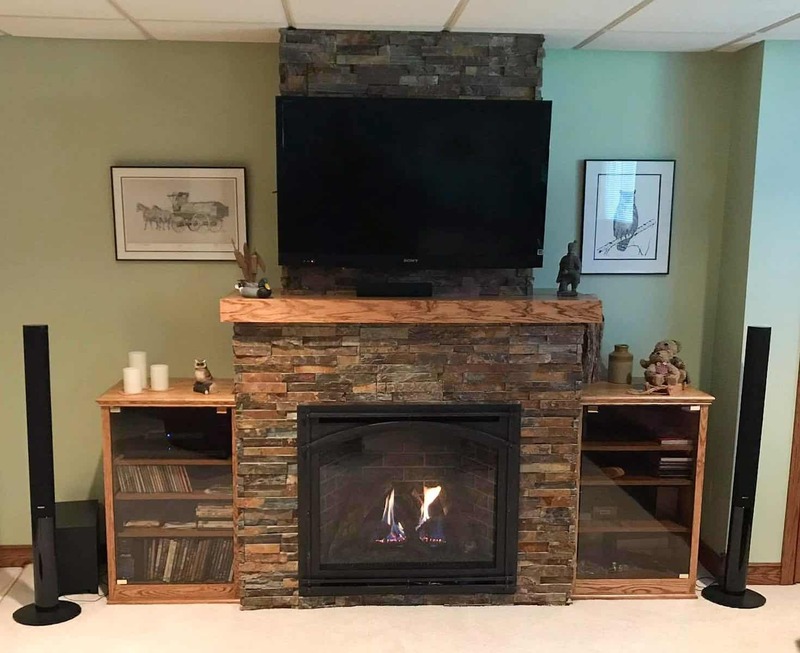 If you are looking to mount your TV above your fireplace, be sure to discuss your options with a salesperson or consult the manual of the fireplace you are interested in installing before you make a decision. In conclusion, having your TV and fireplace on the same wall is definitely a possibility if that’s what you’re looking for. However, it’s important to follow clearances and instructions in your fireplace’s manual to ensure the safety of you and your electronics.